I love it when a logo explains it all. You put on your shoes, and turn on the app. In the background, you hear the throaty hum of an engine and the voice of a pilot speaking into her comm. As you walk out the door, she tells you that you’re on a mission. She doesn’t know what kind, and she doesn’t seem to care, either. Your target is Abel Township, one of the last two remaining strongholds within 100 miles of this area. This is weeks, maybe years after a zombie d-day. Right as you hit outdoors and start an honest jog, the story takes a turn. A missile slams into the helicopter. You hear the crunch of metal, warning beacons, and gears grinding. You’re three miles out of Abel, and maybe a quarter of a mile out on your run. You’re told to jump, so you do. And then you hear the groans of the undead. Horror and athletics don’t usually mix, but with a heaping of pure passion, these two things can gel just as well as sweat and iron. Zombies, Run, is an exciting fitness app from London-based studio Six to Start. Its goal is to tell you the story of a fractured world as you jog, and put you firmly in the thick of it. You participate as a silent and athletically gifted protagonist that the survivors of Abel dub “Runner 5." Runners have a single job: run — run to find new materials, or pick up packages, or trade with others. Each mission in the game presents a new piece of scripted story. Each segment is broken into chunks that are cleverly bookended by your own workout playlists. The stylish Zombies, Run! poster that was given to its backers on Kickstarter. The effect is sort of like what would happen if Stephen King’s The Mist 3-D ever melded with Nike Plus. The narrators, who hiss into different sides of your earbuds as you run, provide a rough context as to where you are and what you need to do. They bump out pieces of story intermittently, as you picture wandering through the bowels of a messed up hospital or explore an air drop outside of Abel base. After each mission, the app turns into something similar to Fallout’s radio stations; it plays your music alongside radio-style commentary and news from two Abel survivors. There’s a much more mechanical game part to Zombies, Run, too. 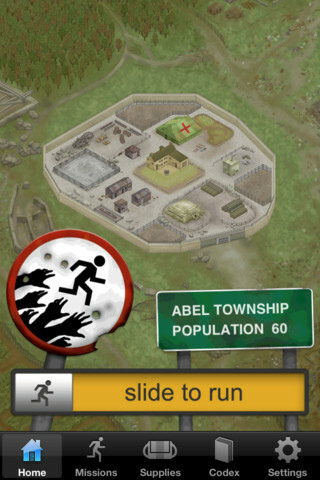 As you run, you’ll pick up items that can be used to boost Abel Township’s hospital, food stores, communication station, armory, residential areas, or recreational facilities. It’s a simple mechanic, but it feels like a treat after an awesome run. Sometimes, you’ll hear the groans of the undead in your ear and have to run faster in the real world to get away from the game’s zombies. This specific part of the experience is its interval training, which is an important element that sets this apart. Most fitness games are horrible at getting you to new heights. Even the good ones like EA Active are bad at this. Band exercises have limitations, and running in place isn’t going to get your bigger or stronger or faster. Pushing yourself safely with intervals in a real world scenario is an important component to any kind of serious training, and Zombies, Run has that. That’s a great element, but what I really think makes Zombies, Run work, and work so well, is its soul. The studio has one experienced runner with a history of using fitness apps and a staff filled with people who dig and understand proper storytelling. They want to deliver something special. As an organization, Six to Start seems like the perfect fit for this kind of app. Adrian Hon is one of the brains behind Zombies, Run. He’s the runner of the office. He tells me that he’s wanted a better kind of running game since the iPhone made its debut. He’s used a lot running apps, like Nike Plus and Runkeeper, as well as a couple of more visual-oriented apps. The problem he sees with these apps is legion. Running while looking at a screen is dangerous, stopping to see your progress is counterproductive, GPS can send you to bad places, and there’s not an element of fun. Hon says he used to hate running when he was younger. He, literally, “Couldn’t think of a worse thing to do." This all changed when he discovered Garmin GPS, which added an element of fun to the mix. Because of this app, he still runs, although its more of a seasonal thing because no-one likes getting out on ice. There's a Zombies, Run store that sells these. “One of the things I really liked about the Garmin was the ‘ghost mode,’ where you could race against yourself." Hon says. “It made me think there was quite a lot that could be done with fitness games. And I think that physical activity — and of course, sports — is inherently fun and good, so it really shouldn’t be that hard to make a game out of them." He laments what studios are doing now with their fitness games. “However, developers have been more focused on the more reliably profitable, yet massively competitive, genres of casual games lately. And more experimental folk find it more difficult to combine tech and physical interaction in a way that doesn’t make you want to shoot yourself when you try to play." 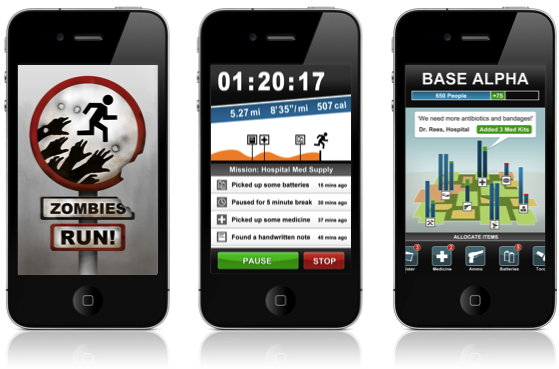 Zombies, Run was the answer to Hon’s issues with fitness apps and a riff on Ghost mode. It’s a viable one, too, because it treats your phone as if it were an iPod Nano. It only spits out audio when you select a mission, and it never asks you to take a gander at it while you exercise. Aside from random zombie horde events, it also lets you decide when you want to push yourself. A lot of fitness games, if they’re not taxing, they’re just screaming at you. It can be a really counterproductive factor in a workout. It’s easier to get hurt this way. 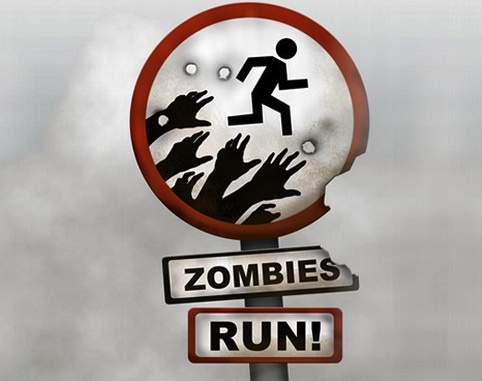 Zombies, Run allows you to take care of your body while also torturing your mind. 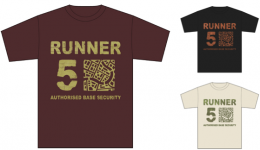 Zombies, Run was a project that floated around in Hon’s head since his Garmin days. He and Six To Start had a lot of ideas bouncing around, but they settled on this one, as it artfully combines super simple play alongside an actual story. The narrative is something Hon obviously enjoys, too. “It’s a shame that so few developers have made more than a token effort to put proper stories in their games," Hon says. “I understand that Triple Town and Bejeweled don’t need stories, but then again, I quite liked Puzzle Quest, so there’s a lot of room in mobile for innovation, but we’re still seeing the same old stuff, even from indie developers." This is the first promotional image for the game on the App Store. Six to Start is all about story. If it isn’t obvious from the fact that it created an audio-based running game about the end of the world, check out its web site. “We are next-gen storytellers," the studio proudly states. “Great storytelling and great gameplay is at the heart of what we do. Storytelling is a huge part of the world’s culture, and great stories have always had the ability to move and excite us, whatever the medium. Play means a lot to us, too. We draw inspiration from video games, boardgames, casual games and playful applications and services." Six To Start believes that through play, people can learn and discover new experiences. When story and play are combined, it gives Six to Start “the opportunity to deeply engage with our audience get them to do new things — as a large single group or individually." It’s getting me to run away from zombies, and think about the world they exist in as I kill my body, so this place is obviously doing something right. Six To Start and Hon’s baby became 3,464 people’s baby, too. Zombies, Run was funded via Kickstarter. The team put up the game’s idea, asked for $12,500 and then received over $70,000 in return. The project was funded in six days alone. Backers received all sorts of neat prizes, including their names in the game’s credits, a poster, or the chance to name something in the game after themselves. Hon has prior experience with Kickstarter, so it wasn’t a big moment when the idea of putting Zombies, Run on the popular crowd-funding service came to him. However, the decision was also a great way to vet the game’s core idea. 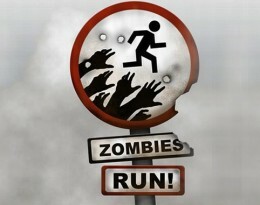 “Plus, we thought that the public would be easier to convince Zombies, Run was a good idea than the usual gatekeepers." I usually stick to high-impact weight lifting. I don’t run because I’m afraid that I’ll lose my precious muscle mass. Call it a tic. The truly awesome thing about this app is that it is capable of embracing your routine, no matter how weird it is. 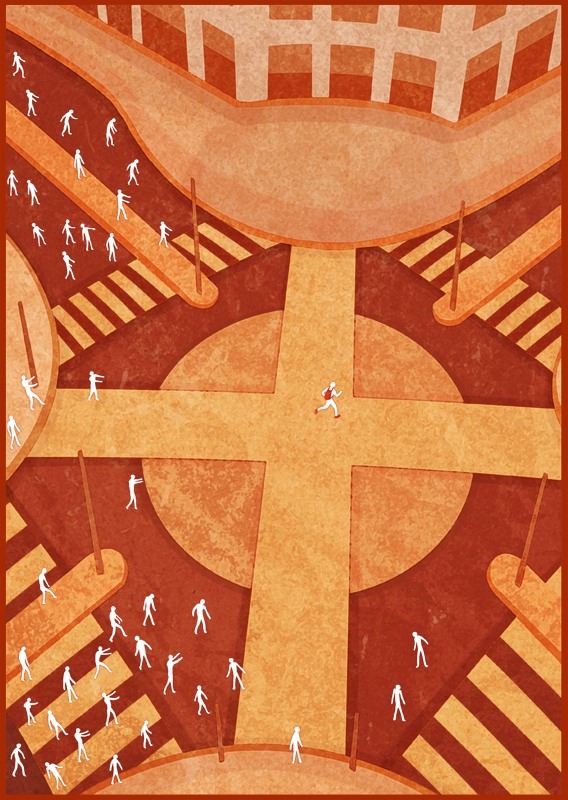 I normally use the elliptical for my needs, for example, and I can use Zombies, Run. All I have to do is turn off the GPS features and turn on its experimental accelerometer functionality and I can play just like a runner might. Conversely, I can also just chill with it, and listen to the story, although this method isn’t preferable. I’m taking Zombies, Run into the gym every day. That’s huge because it’s proving to be a tool. On my calf and thigh days, it’s pushing me, reminding me not to fall into casual or relaxed grooves. I need that because I’m usually only interested in sweating if I’m lifting something spectacularly heavy. I guess games end up changing a lot when the budget suddenly skyrockets. Plus, the story is tremendously well told. This isn’t a blown-up, bombastic tale of a few survivors just making do. There’s subtlety to its characters and its world, and just like The Walking Dead, there are moments of intense action, bookended by periods of drama and character building. Zombies, Run wants to actually tell you a story. It isn’t afraid to do so, and that comes across, even if you might be slightly too tired to care in sections. I never feel like an idiot while listening to it, either. It’s told with a straight face and with enough touch to make it feel like an honest story, and not just some weird nerd fantasy running app. There’s interesting stuff tucked into each mission — stuff you want to tune in order to learn more about the world Six to Start is building. Also, of note, this isn’t a trainer. It doesn’t scream at you. It might nudge you with the zombie horde attacks, but the app doesn’t get in your face. It let’s you do your own thing in your own way. It was designed specifically to do this. “We want to enhance people’s lives by making their workouts fun, not turn into nagging machines," says Naomi Alderman, the writer of Zombies, Run. Mission accomplished, I think. Zombies, Run is available now on the App Store for $7.99. An Android version is coming down the pipes, too. Currently, the game has a total of 20 missions. More missions are slated to come down the line as IAP. Check it out if it even vaguely interests you. I think you’ll be surprised by its purity — and its scares.